A blowgun (also known as blowpipe or blow tube) is a short-range weapon that consists of a long narrow tube for shooting light projectiles such as darts. It operates by having the projectile placed inside the pipe and using the force created by one’s exhalation to pneumatically propel the projectile. Projectiles include seeds, clay pellets, and darts. While blowguns are used mostly for entertainment purposes in Europe and North America, many indigenous people in South and Central America use these weapons for hunting small game, such as monkeys (Source). 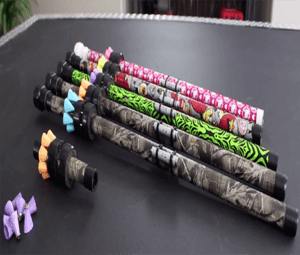 In this review, we will be reviewing the five best blowguns in detail. 3.4 What’s IN The Package? Our top pick is a 36-inch high-velocity blowgun made of top-grade aluminum. This is a .40 caliber blowgun equipped with a tactical peep sight. This model is made of lightweight aircraft-quality seamless tubing. It is also fitted with a foam grip, a mouth and muzzle guard and boasts a high-quality finish. 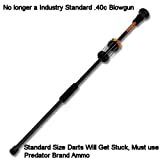 Venom Blowguns’ .40 caliber high-velocity blowgun comes with dart quivers with twelve darts and eight super stun darts, but the cone color may vary. No one can legitimately complain about the quality of this product. We recommend that you buy this with confidence, as you have very little to lose, and a very cool thing to gain. It bosts a lightweight, sturdy construction and it is also astonishingly accurate. Our top choice comes with needle-sharp darts, and it can be an extremely powerful weapon, depending on the user’s lung capacity. From a distance of 18ft you will be able to pierce through an old copy of the Guinness Book of World Records through the front all the way to page 235. The darts also are said to be able to penetrate about two inches into the side of a standard sized tin can, and even through a standard steel beer bottle cap. The Cold Steel 4 Foot .625 Blowgun occupies the second spot on our list, not least because it has an effective range up to 20 yards or more. With practice, a skilled user can hit a two-inch circle at amazing distances, delivering a heavyweight dart. This payload is easily capable of penetrating a half-inch sheet of plywood. Accuracy and range like this enable an experienced hunter to take down small game like doves, quail, squirrels and rabbits in complete silence without danger of over-penetration or errant darts striking livestock or humans in the distance. Shooting this blowgun is great fun. It is an activity that can be enjoyed indoors or out, in sunny or rainy weather. Skill with a blowgun can lead to many inexpensive hunting adventures and give you a good chance in survival or self-defense situations. This model comes with a target-style mouthpiece and three-millimeter-thick barrel, which is almost twice as thick and half as heavy as the company’s standard models. This added weight and rigidity dramatically increase accuracy, not to mention durability, and the gun comes complete with a wide variety of darts for different shooting situations. Our number three choice is a highly accurate 36-inch 40 caliber blowgun by Bunker Buster. These .40-caliber blowguns fire darts at up to 350 feet per second and are excellent for either target shooting or hunting. The 36-inch, one-piece anodized aluminum barrel has a foam hand grip for comfortable handling and an anti- inhale safety mouthpiece. The muzzle guard includes a handy sight, and the carry sling makes it easy to throw the blowgun over your shoulder. 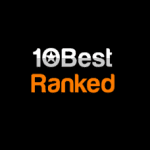 It includes 16 sharp wire darts, 10 spear darts, eight spike darts, eight super stun darts, eight stun darts, a dart guard and target. The quivers include two, 8- spike dart/super; one 16-dart; two 10-dart and one 8-stun dart. This product is made in the USA and is offered in the following colors: Green Camo, Gray Camo, Black Evolution, and Purple Evolution. It also comes with a lifetime warranty. This model Terminator blowgun promises to give you hours of shooting fun. The two-piece .40-caliber, high-power blowgun fires a dart at up to 350 feet-per-second and therefore deserves the number four spot on our list. With you will be able to penetrate 1/4″ into the bark of an old tree with the little spikes, and about 1/16″ with the longer wire darts. This super-powerful blowgun is also very safe to use, because it is fitted with an anti-inhale safety mouthpiece. It also has a muzzle guard, a sturdy anodized aluminum barrel and a foam hand grip for shooting and handling comfort. At 36″ in length, this blowgun comes with 12 sharp-wire darts and a 16-dart quiver. Each includes a safety decal on the barrel and a target. It also comes with a lifetime warranty and is made in the USA. Predator Blowguns’ 36in. two piece .40 caliber blowgun deserves the fifth place on our list for its unrivalled safety, well complemented by a pocket-friendly retail price. Each two piece .40 caliber blowgun comes with 1 mouthpiece, 2 quivers, foam grip, muzzle guard, and 12 standard blow gun darts. This is most fun and easiest to use blowgun you have ever seen! It doesn’t take a lot of investment on your part either. The Two Piece .40 Caliber blowgun is a deluxe, super safe model. It comes with the two most popular dart types, the target and stun dart. You get twelve target darts, which are sharpened 4-inch needles with a precision cone for ultimate accuracy and performance. These are used for target practice, shooting small game, and for dartboard games. Ready for your use on the gun are also two types of quivers to hold all your darts for quick access. This is an ultra-safe model with the safety mouthpiece, to keep you from inhaling the dart, an extra foam grip for an extra secure hold to get the most accurate shot, and the dart guard to keep your hand protected. Blowguns are not toys! They can cause injury if not used maturely and with the necessary precautions. Adolescents must use a blowgun only under the supervision of an adult. Please, read the safety instructions before using your blowgun for the first time. The possession of a blowgun is restricted by law in states such as California. Before proceeding with your purchase, please consult your local police department if you can legally possess and use products such as those reviewed above. When choosing the best blowgun for your needs, consider the materials it is made of. All models discussed above are made of top-quality materials and are designed with safety and comfort in mind. In general, look for a blowgun that is 100% made in USA. Before ordering a blow gun, you should first decide what size and color you want it in. Most manufacturers offer seven different sizes to choose from in different colors, but some colors only have certain sizes, each with a different price. There often are six colors to choose from: black, red, blue, purple, green camo, and urban camo. Price is one of the most important factors that you have to take in mind before purchasing one of the bad boys reviewed above. While this should be a relatively inexpensive purchase, the retail price of some of the more upscale models may reach $70. Although some models are offered for under ten dollars, we recommend that you stay clear of these. 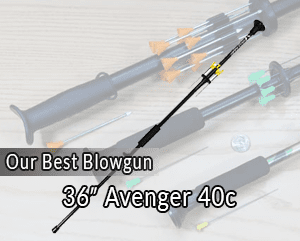 The average retail price of a good, reliable, and safe blowgun is just above twenty dollars. Blowguns may be used for shooting targets and/or hunting. A .40 caliber blowgun is a fun blowgun to shoot. Your 36-inch blowgun can be perfect to shoot targets with, but when it comes to living creatures, it can’t take down anything larger than a rat. If you are going to be target-shooting and hunting, we would recommend nothing smaller than a four-foot .625 caliber model that is often offered with a two-foot extension. If you decide to shoot at tournaments, you are maxed out at 48 inches. 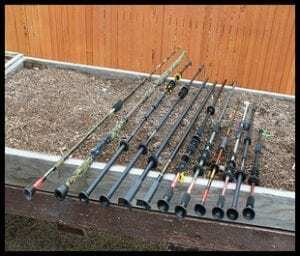 If you want to hunt, you will have a blowgun that has the power to kill and you can add the two-foot section for some extra velocity and better accuracy. The Cold Steel Broad Head dart is usually made of poly-resin. You are most likely to receive these darts bent from the rubber band holding them. They do not bend back straight easily and the ball just behind the broad head stops penetration at about 3/4 inch. Also, the head is not sharpened upon arrival. If you want a dart that is going to skewer an animal, the Bamboo Dart is what you need. This type of dart is longer than all the other darts by several inches. It is also lighter and flies faster. This is not the most powerful dart to choose, but it does a good job. Take the time to use different types of darts and see which one works best for you. Get to know how they all shoot. Some fly smooth, fast, and true, while others are a little heavier but will do more damage and kill faster. One of the blowgun’s irreparable shortcomings when it comes to hunting is that you can only hunt a small game with it, unless you dip the tips of your darts in curare. Because of their simplicity and effectiveness, blowguns have been around for hundreds of thousands of years. If you find yourself succumbing to their charm, this review has certainly helped you choose the most appropriate model for the adventure you have planned. All the models reviewed above should be used safely and responsibly. A blowgun must never be aimed at individuals or pets, because any misuse is a criminal offence! Last but not least, if you have decided to buy one of the more powerful models that are suitable for small game hunting, we advise you to check with your local wildlife agency if you need any special permit to hunt with a blowgun.